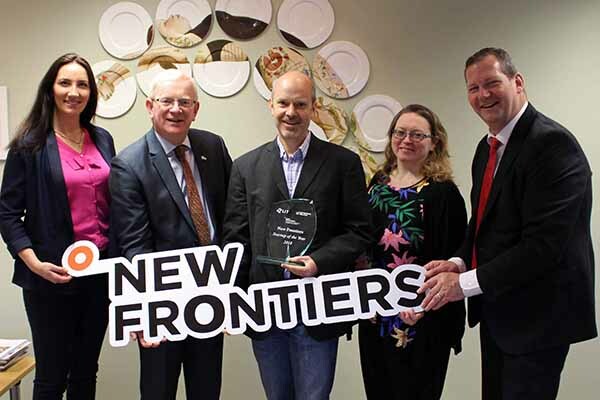 Nine new business leaders showcased their start-ups at the LIT New Frontiers Start-up Awards 2018 ceremony in the Millennium Theatre at LIT’s Moylish Campus. The nine have all just graduated from the New Frontiers programme delivered at LIT’s Hartnett Enterprise Acceleration Centre in collaboration with the Nexus Innovation Centre. The event, which was organized by LIT and Enterprise Ireland, recognises different aspects of entrepreneurship through awards for Startup of the Year, Best Business Opportunity, Best Innovation and One to Watch. 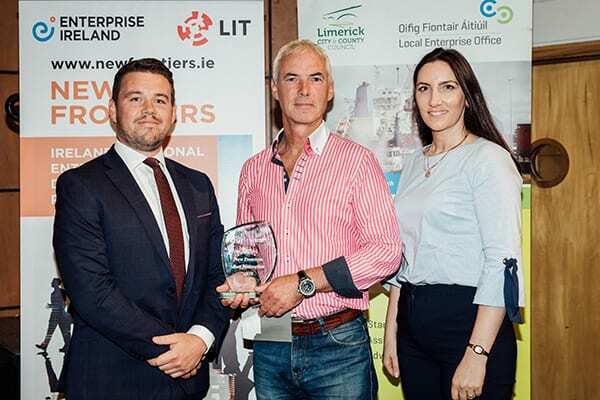 LIT, the Limerick Local Enterprise Office, HOMS Solicitors and Bridgewater Management have come together to provide prizes for each award and give the entrepreneurs a boost on their way to fame and fortune. The keynote speaker was David Evans MBE, a serial entrepreneur who founded The Grass Roots Group in London in 1980, which today employs thousands of people and has offices all around the world turning over hundreds of millions of pounds. David sold the business in 2016 for $120 million and is now leading a number of new enterprises including Matildas Planet, a client of the Hartnett Centre on campus at LIT. 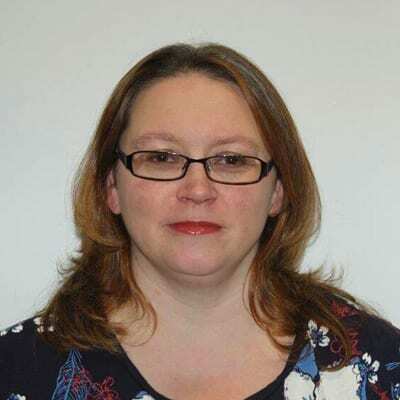 A leader in the field of motivation, David has been listed in HR Magazine’s top 100 influencers many times over and was the first person to receive an MBE in Britain for Corporate Social Responsibility. David told his story sharing some insights on focussing on purpose versus profit. “One of the paradoxes of business,” he said, “is that the most profitable companies are not those that are most profit-focused.” Sharing that, like Grass Roots and his latest venture Matildas Planet, they were able to harness the power of purpose to drive performance and profitability and enjoy a distinct competitive advantage. “With a purpose and customer focus, you can build a greatly profitable company – for those focused purely on profit it is often disastrous because methods, now geared to meeting the metric, are detached from customer purpose and meeting your customer needs.” Having a purpose shouldn’t be just aspirational – have the right measures and methods to keep you customer-centric and valuable. David finished his keynote speech commending the Startup Class of 2018 impressed by the opportunities presented on the day. 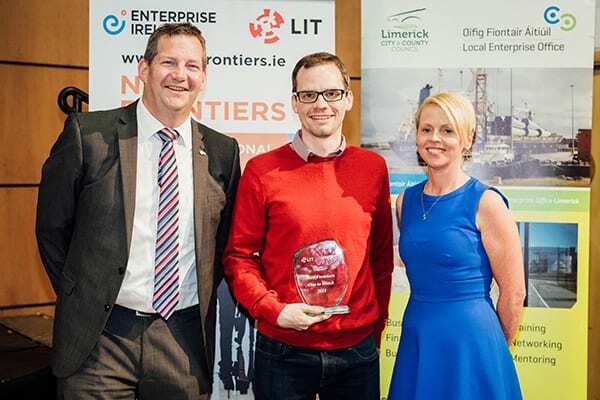 The winner of the award for LIT New Frontiers Startup of the Year was Ger O’Keeffe, who holds a PhD in Applied Physics from DCU and a BSc in Experimental Physics from UCD and worked for many years at Intel and other multinationals before he set up Assuré Medical. It’s a new medical device company with a specific focus in treating Urinary Tract Infections (UTIs) affect up 60% of women sometime in their lives and is a recurrent scourge for some 20% of all women. The most common treatment for UTIs is antibiotics. One estimate says UTI treatment accounts for 10% of all antibiotic prescriptions. As an alternative to antibiotic treatment, the business is developing a self-administered prophylactic that prevents the UTI from occurring in the first place. Assuré Medical’s new product is scheduled to begin trials in 2018. 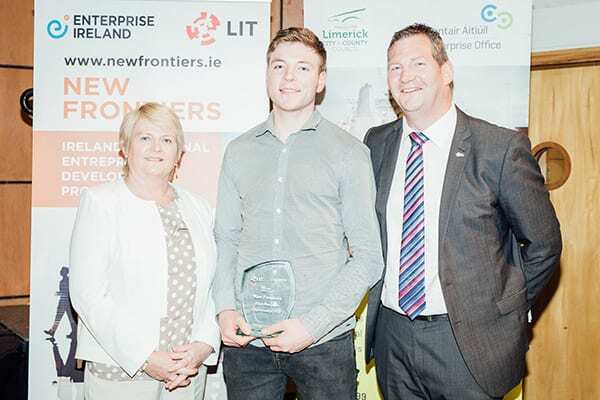 The winner of the award for Best Business Opportunity was Richie Commins, who said, “Coming straight out of college, New Frontiers was extremely beneficial for me. Getting the advice and mentorship helped mould me and the business from a very early stage.” Richie’s start-up, Flag, is a taxi app that allows users to travel and pay with or without their phone bank card or cash. The app is similar to other taxi apps, but a feature unique to Flag is what is called ‘the wallet-less feature’ which allows the user simply to flag a taxi off the street, give the driver his or her name and enter a four-digit PIN on the driver’s app to effect payment from his or her pre-registered card. The winner of the award for Best Innovation was Iain Gilmore, a former Irish National Tarmac Rally Champion. He said, “The New Frontiers process allowed me to take my initial concept and develop it substantially, splitting it into three distinct products that we now are trialling in the Automotive Aftermarket.” Iain’s LYNKMechanic is a new online booking system that on the one hand allows motorists to book a servicing at their local garage quickly and on the other hand converts the booking information into servicing data that helps mechanics to operate more efficiently and accurately. The winner of the award for One to Watch was Gerard Comerford, a competitive e-sport player in Pro Evolution Soccer who started up Cerebros Games – which is a disrupter by definition. He’s making deliberate use of the disruptive innovation model to first address players’ under-served desire for innovative gaming experiences at a low cost, using that business to fund products that deliver ever more sophisticated innovative experiences that engage players’ intelligence and creativity. Allen Wixted’s company, No Place Like, displays your products using augmented reality to help convert your online sales. Allen describes himself as an ‘app designer and developer from Limerick turned entrepreneur’. Barry McMackin, who heads up Fintech.ie, has multiple financial and business academic achievements as well as experience with blockchain. He said, “New Frontiers brought home to me the importance of establishing a strategy and being clear to yourself about what you want to achieve. It also gave me a good place to learn and to keep asking questions.” He went on to explain that Fintech.ie is a meeting place where start-ups, investors and corporations can build partnerships. Javier Yanez holds a degree in Industrial Design from the School of Art and Design in Lima Peru. His startup, Geo Gardens, has developed a building system that minimises production and assembly costs for the sort of highly complex and insulated structures required for horticulture. The company’s focus is on enabling vertical growing systems that will minimise production cost and increase earnings for producers.